It makes sense that WPIs are a hot topic: protein is a must-have ingredient these days, with 78% of U.S. consumers saying they believe protein contributes to a healthy diet and more than half say they want more of it in their diets (NPD Group). RTD protein beverages are one of the categories that’s taking advantage of protein’s value, as these types of drinks are popular not just with those who make workouts a priority, but among the everyday consumer as well. 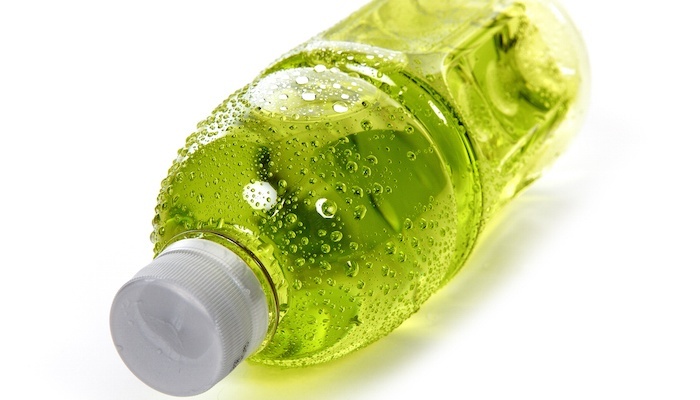 It’s also a key component in smoothie-type beverages and protein-added juices and teas. What’s the stability of Ultra? Typically WPIs are soluble at low pH and are heat stable; Grande Ultra is stable up to pH 3.5 and can often stay in solution without the aid of a stabilizer. Clarity / integrity during thermal processing: A common issue with shelf stable beverages that include whey proteins is that a small portion of whey protein can be denatured and aggregated during thermal processing, resulting in a turbid solution or white precipitate that consumers perceive as a defect. Grande Ultra, though, provides the best combination of clarity and flavor across a wide pH. 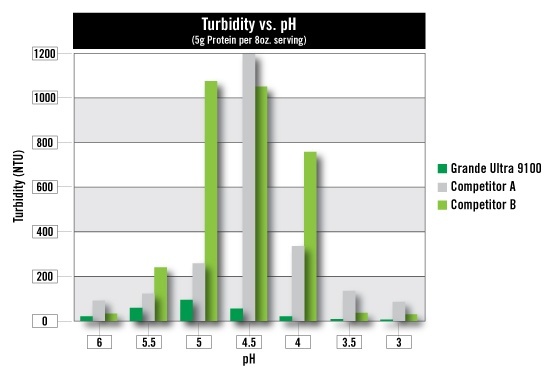 At a pH of 4, for example, Grande Ultra 9100 has a turbidity (NTU) of much less than 100, while competitors average 300 or more. What flavor does WPI impart? Grande Ultra has a neutral taste and can be added to formulations without affecting the flavor of other ingredients. Working in systems with gums: Stabilizers are generally not needed below pH 3.5 in acidified clear whey protein isolate RTD beverages. What other questions do you have about WPI in your application? We’re eager to share whatever information is helpful as you work to develop a product or solve a formulation challenge – just reach out using our Contact page!